It seemed all was lost for the Ferrari F40 wrecked in Houston way back in 2011 after a mechanic responsible for the car took it for a joyride. Now it has a new lease on life and a new home thanks to Gas Monkey Garage of Fast N' Loud fame. 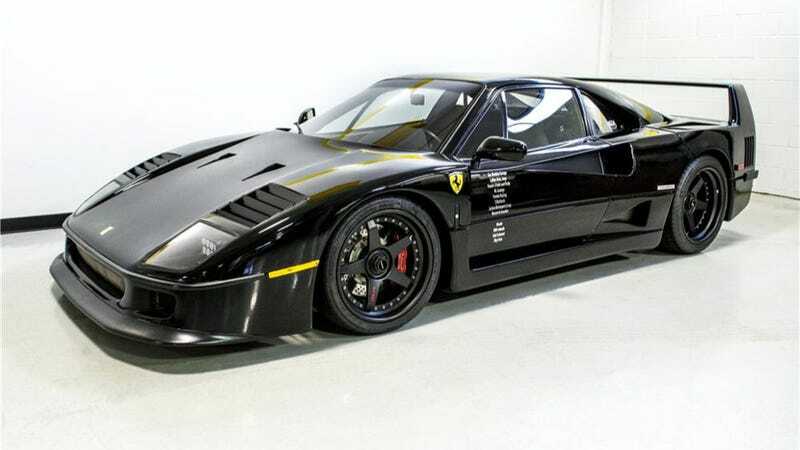 If you're not familiar with the story of this black 1991 F40, it went down like this: the car was originally red and owned by a Houston resident who trusted it to a mechanic while he was in Europe on business. That mechanic put it into an iron fence, destroying much of it in the process. With the frame seriously damaged, the car seemed beyond repair until Gas Monkey Garage got ahold of it. As CarBuzz notes, they not only fixed it but turned it into more of a monster than it was before, adding rebuilt turbos, a Tubi exhaust, an aluminum flywheel, custom Penske Racing adjustable shocks, HRE three-piece alloys and Kevlar clutch pack, and boosting power to 550 horses. The restoration was covered on Fast N' Loud. Clearly, they did a fine job, because the resurrected F40 sold at a Scottsdale Barrett-Jackson this weekend for $742,500 $675,000. Pretty excellent for any F40, let alone one that just came back from the dead. The buyer? None other than Mr. October, baseball legend and noted vintage auto enthusiast Reggie Jackson. Happy endings are always nice, aren't they? Let's just hope Reggie has better taste when it comes to mechanics. Update: According to the Gas Monkey guys themselves, the F40 went for $675,000. Including fees, that brings the price to $742,500 as previously reported.